I liked P.S. I Still Love You! It’s cute and light and fun and it’s a good summer read. There is something that’s sweet about how much of a romantic Lara Jean is. There is a certain innocence about her, and she is naive, and it’s refreshing and not irritating (well, to me, it might be irritating to you, but I like that about her). I totally get that she needed to let go of Genevieve, and that it was hard for her, and especially when someone else comes into the picture. I loved Kitty, who is just full of awesome, and she is my favorite character. Peter Kravinsky is pretty awesome too, and while I liked Lara Jean, I kind of wish we saw more development. Like, I like that she’s a hopeless romantic, and had a hard time not comparing her relationship with Peter to the one he had with Genevieve, and she has changed over the last couple of books, but not as much as I would have hoped for. 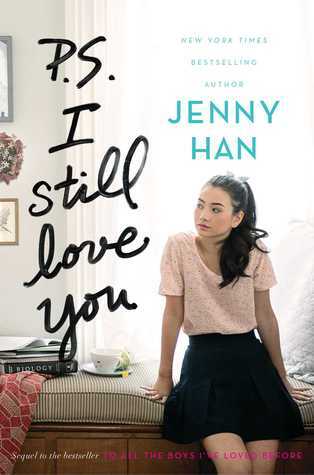 It hard, because I keep comparing to her Summer trilogy, which I loved, and it didn’t have the same charm and nostalgia that series had, but it did have its good moments (it is Jenny Han, after all) and there is something about her books that have a certain charm. I also kind of wish that there was a happily ever after, because I felt like there was a happy for now ending, and I wanted a happily ever after for Lara Jean, who totally deserves that, because she’s Lara Jean. 3 stars. I liked P.S. I Still Love You, but I really wish it had another book after it, as the second in a duology, it was a little bit of a let-down. I wish that I knew why I feel that way, but I really don’t. I’ve always wanted to read this, but I have to read the book 1 first. I hope I’ll be able to find time reading To All The Boys I’ve Loved Before 🙂 Thanks for your review!